Medford, OR - West Coast racers will get a full taste of a Grassroots Bracket Series when Scotty Richardson and crew come to town this weekend. 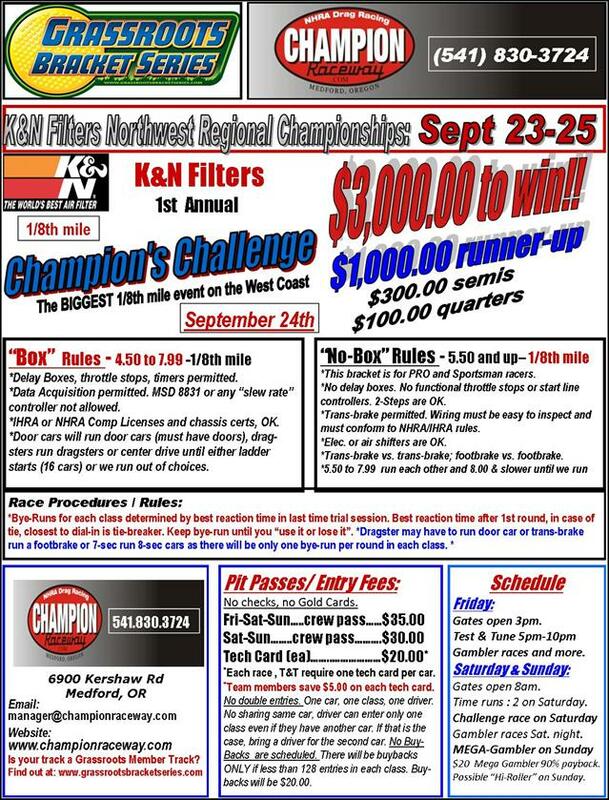 Champion Raceway in Medord, Oregon will play host September 23rd - 25th. Medford, OR - In the division’s Top Sportsman class it was Wayne Newman, Lancaster, Calif., taking the win while Gene Heaton, Vancover, Wash., won in Top Dragster. Also taking home wins were Tom Stockero, Bend, Ore., in Super Pro; and Patrick Arnott, Redmond, Ore., in PRO. Medford, OR - Electronics and Non Electronics racers throughout the west will have a chance at over a $50,000 total purse this weekend at Champion Raceway in Medord, Oregon. With a top prize of $10,000 in Super Pro and $3,000 in Pro, the best of the west should be in attendance. Medford, OR - The win in Top Dragster went to Terry Wilcox, Sumner, Wash., who defeated Terry White of Half Moon Bay, Calif.
Medford, OR - Champion Raceway held its fist “Medford Megabucks” race on May 29-31. The three day race was presented by JEG’S and Bi-Mart. 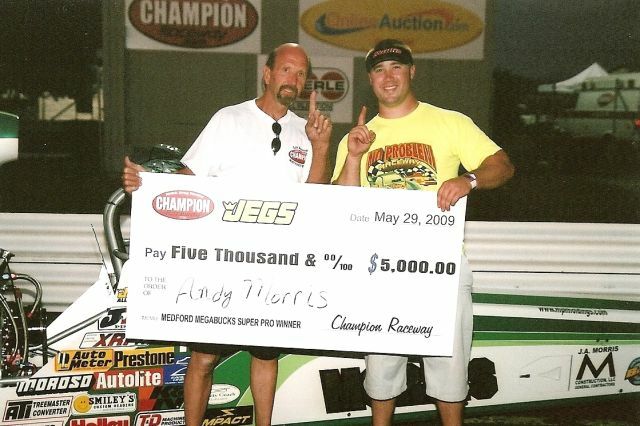 There was $50,000 in prize money and $7000 in JEG’S dollars which made this one of the richest drag races in Oregon. 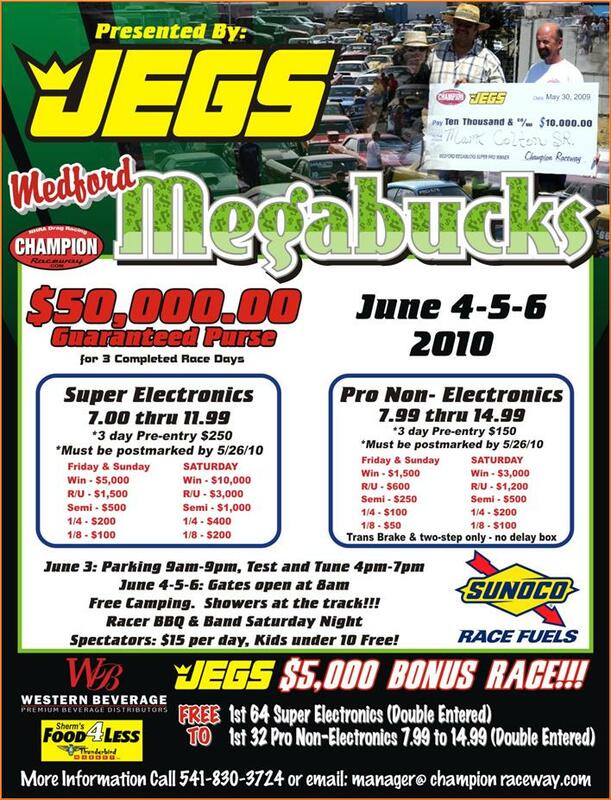 Medford, OR - West Coast Bracket Racers will have their first taste of Big Bucks Racing action this weekend at Champion Raceway in Medford, OR.